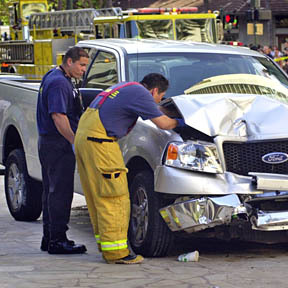 Honolulu firefighters worked yesterday on the engine of a Ford pickup truck which was driven onto the Kalakaua Avenue sidewalk, running over several pedestrians, killing one person. The truck came to rest near the Waikiki police substation. »Fantasia Barrino is named the new "American Idol"